The holiday cottage of "Bryn Teg" can be found in Cemaes Bay in Gwynedd. This cottage sleeps 10 people, and has 5 bedrooms. The cottage has the following bedrooms: Five bedrooms: 1 x second floor super king-size double (zip/link, can be twin on request), 2 x king-size double, 1 x twin (zip/link, can be super king-size double on request), 1 x second floor twin (zip/link, can be super king-size double on request). Bathroom with roll-top slipper bath, separate rain shower, basin and WC. Shower room with shower, basin and WC. Ground floor shower room/utility with shower, basin and WC. Kitchen with dining area, day room (seats 5) and woodburner. Sitting room (seat 8) with open fire. 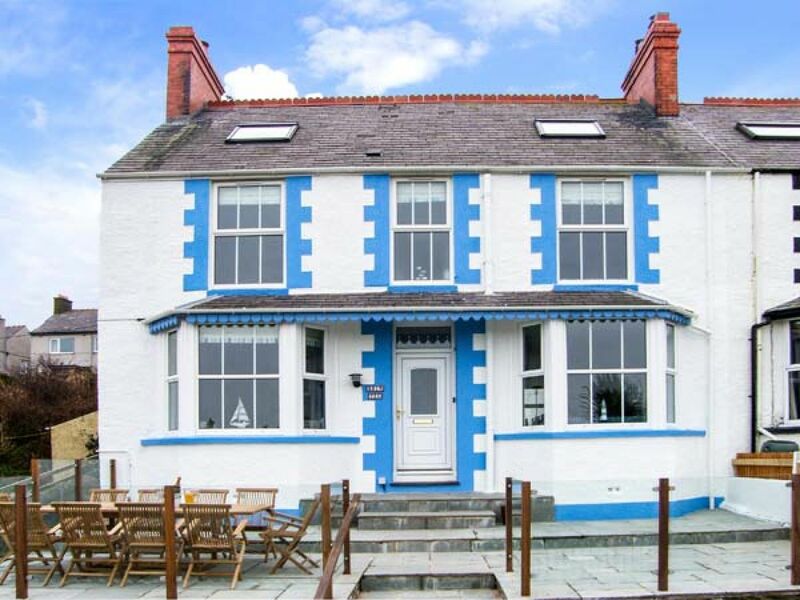 If you're after a large holiday cottage in the Cemaes Bay area; Bryn Teg could be for you. These are the reviews for Bryn Teg. There are 26 reviews. Has everything you could need for a large group. The facilities were excellent and we had no real concerns. The hot tub was great as was the barbecue, and both were well used!. The only slight niggle we had (although I'm not sure how it could be avoided) was that in the extremely warm weather, the winter duvets were a bit too warm. However, I suspect that 25-30 degree heat in Anglesey is rather uncommon! Many thanks to Linda, the owner, for providing such a delightful holiday home for all 8 of us. Very well equipped kitchen with everything that you could need. Two fridges and a wine fridge. Amazing views over the bay. Beds very comfortable, bathrooms were spotless and hot tub is huge! Owners very welcoming greeted us in person and even made brownies for us. Our every need was catered for. In the village there's a local shop, a butcher, a deli and a great fish and chip shop. There's also a local pub called The Stag which is dog friendly. We went out on a boat ride from the harbour which can be arranged whilst you're there (the dog can go too!). Beautiful walks along the coastal path and on the beach. We've already booked to go back next year. They have paid attention to little details. The flowers and home made brownies go a long way to making a holiday. I am full of praise for Bryn Teg. The white goods, fixtures and fixings are high end. I am not saying it is the cheapest but it represents excellent value for money. The sea view and spa tub add a lot. We had 8 adults and 2 children in the house and it did not feel cramped. I imagine they will be fully booked all year round. My advice is to get in early. The location is marvellous. A proper old fishing village. Peaceful and remote but with enough on your doorstep to ensure you do not have to drive everywhere. It reminded me of Cornwall before it got commercialised. The welcome pack was very nice just everything to make your stay complete. One of the best things was the beds they were so cosy unlike other cottages we have visited. 11 out of 10. Dave Revitt. Hosts were very accommodating too. Great location, lovely house and perfect owners. Had a wonderful time and would love to return. Would recommend to anyone. Wow, what an amazing house to stay at. Everything was perfect from start to finish. On arrival we were met by Linda (owner) who gave us a tour and left us with an extremely helpful welcome basket - such a nice touch. All of the bedrooms are decorated in a lovely manner, the kitchen/sitting area and living room are both excellent spaces for family gathering. The hot tub is a real bonus at the end of the day too. Locally we ate at The Harbour twice and both meals were excellent, we also had a snack and drink at The Gadlys Hotel which looked amazing. The chippy in the high street was great too. The sea is just moments away from the front door and the bay is lovely. Some great coastal walks straight from the doorstep too (although a bit windy in February gales!). All in all, a truly fabulous break and I wouldn't hesitate to recommend to anyone. We will be back! Linda was so hospitable from the start with a delicious and very useful welcome pack. The house is decorated to a very high standard and the facilities leave you needing nothing else! Dogs are made to feel very welcome and the beach is a stones throw away. We thoroughly enjoyed our stay with lots of walking and sampling of the local hostelries and will definitely keep it on our places to revisit and would hope to do so very soon next month. The walks from the house were super. The house was brilliant it was so well fitted out with everything you might need, it was warm and homely and the owners left us a lovely welcome pack I could not rate it enough. Lovely welcome basket on arrival. Beds are really comfy. Hot tub was really nice. Local pub was within walking distance and staff friendly. Overal a nice place to stay. Good location for getting around the island. Owners were very helpful and friendly. Made us very welcome. Ideal location. Just 10 out of 10 in every field. Everything was catered for and thought of. Had a great week both in and around the house and on the Isle of Anglesey. We hope to be back again! Lovely position in the bay plenty of parking, going to rebook! Bryn Teg seemed the perfect choice for a family gathering to celebrate a year of milestone birthdays from 21st, 30th, 60th (me!) and 80th. From the moment we walked through the door, we were embraced by the warmth of this beautiful property. Each room we walked into had a wow factor from the cozy sitting room with open fire, to the slipper bathtub in one of the 3 bathrooms. The 2 super king sized attic bedrooms were equally stunning and continued the blue and white seaside theme that ran throughout the house. The 'hot tub' bathroom on the ground floor was very useful as it not only contained a shower but also a washing machine, tumble dryer and a very useful wine cooler; a great room to use in tandem with the hot tub outside, which was very popular with a glass of bubbly at the end of the day. But hub of the house for me was the fantastic kitchen/living area with the range cooker, log burner, long dining table for family meals and the and comfy chairs at the other end of the room so that we could all sit and chat while cooking. It was certainly the right choice for my family gathering which also included my two grandchildren aged 2 and 4, they loved the beach a couple of minutes walk away. Cemaes Bay itself is a very pretty little village and there are equally lovely bays along the coast such as Bull Bay, Red Wharf Bay and Beaumaris, all are definitely worth visiting. Linda, the owner couldn't have been more helpful. The house included absolutely everything you would ever need. We took far too much with us for the kitchen, but take it from me, Linda thought of everything, even a bunch of flowers, a welcome basket and a tin of home made brownies - how welcoming is that! We all left this wonderful house having made memories to last a lifetime. I would love to return and I thoroughly recommend this gem of a cottage. What a beautiful find, an excellent holiday let. Stunning views of the beach, outstanding standard of decor throughout with high standards of bedding, towels and an extra delight of a hot tub at the rear of the property. The owners have thought of every detail, we were even greeted with a wonderful welcome pack including a delicious chocolate cake! We would highly recommend this property to couples and large groups, just gorgeous!! Teulu wedi aros yn Bryn Teg am benwythnos hir ac wedi mwynhau yn fawr iawn, croeso gwych, safon a glanweithdra. Manion megis basged groeso a tan cynnes yn gwneud gwahaniaeth, Twb poeth yn boblogaidd iawn hefyd. Family stayed at Bryn Teg for long weekend and really enjoyed, fantastic welcome, quality and cleanliness. Added touches of welcome basket and fire made difference. Hot tub was really popular too. We recently stayed at Brynteg with family and friends for my 50th birthday. The house looked nice on the pictures we had seen via the booking agent, however the house was even nicer than we had thought. The house is immaculate and the bedrooms and bathrooms are like hotel rooms. The beds were extremely comfortable and everything is very good quality. The kitchen was very well equipped, with more equipment in the kitchen than I have ever had at a holiday rental. As we were a large group I had taken extra pans etc but they stayed in the bag. Wine chiller in downstairs utility/shower room came in very handy. The house is very well located only about two minutes walk from the beach which was great for our dog. We also had fireworks on the beach one night which was great. The house is very dog friendly, with dog towels etc supplied by the owner. Woodburner and open fire also however as was really mild we did not use them. Owner was very friendly and extremely helpful even offering to take our shopping on when we were running late. Loads of lovely beaches nearby for great walks with the dog. A lovely clifftop walk nearby with some fantastic scenery. Fish and chips from local chip shop were lovely and chinese from nearby Amlwch also was very nice. My friend who was with us has booked the house for next year. Hot tub also was very good quality. I would definitely go again. The house is in a fantastic location, 30 seconds walk up a driveway from the beach road. There is a table seating 10 in the front landscaped garden, another in the rear enclosed yard, and another in the kitchen/dining room. The rear enclosed yard has a hot tub and barbecue available for use. There are 3 bedrooms on the first floor and 2 up in the loft space (staircase to the loft bedrooms is steep). There is a ground floor shower room which also contains the washer and dryer (and a wine chiller) and then the main bathroom is on the first floor along with another shower room. There is enough space for a party of 10 so you dont get under each others feet. The house is perfectly presented and all the utensils and equipment you need are provided. We were met by the owner and given a walkthrough of where everything was and how to worked. There is a log burner in the kitchen/diner and a coal fire in the living room. The beds were extremely comfortable. The front steps up to the property are quite steep and large however you can use the side ramp to the rear yard and then go in through the back door without steps. The property has one parking space which fits medium sized cars but there is free parking available on the main road by the shore at the end of the driveway. We had a cracking time at Bryn Teg. The newly-renovated house was easily able to accommodate nine (four kids under six) of us for a week. Five bedrooms, three bathrooms, large kitchen and reception good showers, comfy beds, large kitchen, big reception room, light and spacious throughout. The house had literally everything we needed, many things we didn't realise we'd need until we got there (wine fridge!). The hot tub in the back garden was good fun, especially for the kids. The house is literally next to the beach. The nearest part of the beach is good for rock-pooling, round the bay is better for being on the beach. Cemaes has most of what you need day-to-day: small convenience stores, couple of pubs, good fish and chips shop.... 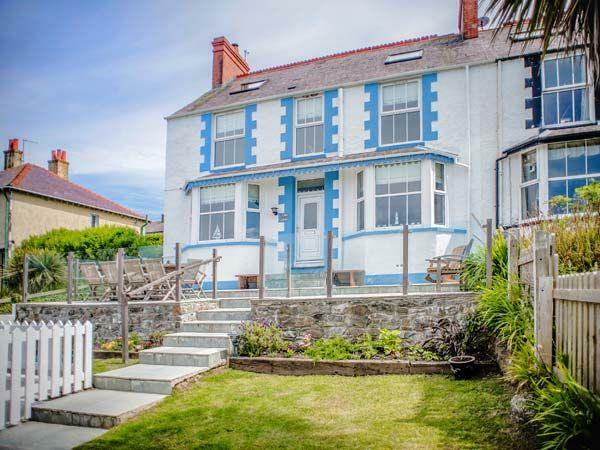 It's also well located to explore the best that north Anglesey has to offer: South Stack Lighthouse, Trearddur Bay, Lligwy Beach, Benllech Beach... Some of the others in the group enjoyed an excellent meal at the nearby Lobster Pot. We'd definitely go back to Bryn Teg. It was a big hit. And what's more, the owner (Linda?) was particularly helpful in terms of booking and dealing with any queries we had. If you're looking for other cottages around Bryn Teg, we've got some cottages below which may take your liking. There are 47 cottages within 5 miles of Bryn Teg - and they have reviews too.